Following the steps in the PDF. I am unable to get the omni to work in the sample scene while in gamepad mode. I get the error Omni reading data failed error. I know the omni is working because i can enter Developer mode in the omni connected and switch to KB mode on the omni connect and it works. Are you using the "OmniControllerViveSetup" or the "OmniControllerOculusSetup" player controller prefab? If you are using the Rift, make sure you are using the "OmniControllerOculusSetup? Check the Omni Controller script on the prefab and make sure that there are not any missing references. Are the PODs plugged into the shoes? Check Omni Connect and make sure that everything is connected properly. In Omni Connect, go to the advanced tab and click on "Streaming". Is it reading the data properly? And is this in Unity or UE4? Im using the OmniControllerBaseSetup. Per the documentation, suppose to use it for the rift. 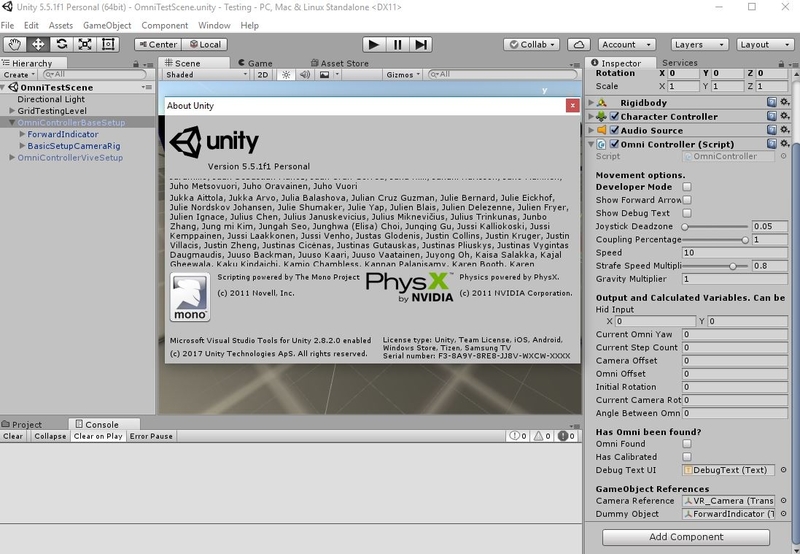 and using the Unity integration. Can you upload a screenshot of the "OmniController" component on the "OmniControllerBaseSetup"? Nothing in the streaming section is giving any feedback when in gamepad mode. The steps indicator is incrementing when walk though. Do you see any errors in Omni Connect? If so, please provide the exact text. Hey @netwired in addition to Cameron's above questions, do you have the Ring cable plugged in? Omni Connect will receive step data even if that's not the case. Yes Ring cable is plugged in. Side Note: Just now when checking the above items. The streaming section was showing data. Tested spinning the ring and it was properly represented on the UI. After a couple seconds everything stopped and no longer streaming data... Tested swapping USB ports and it appears to be working now. I will continue to monitor, but it looks like it was a USB problem on my PC. Thank you all for your time.